In this podcast episode, Emily interview Lauri Lutes, a fourth-year PhD student at Oregon State University and single mother. Lauri’s stipend is equivalent to the local living wage for just one adult, yet she supports herself and her daughter on it without using student loans. Lauri details how she makes ends meet by taking advantage of every possible university and community benefit, such as subsidized and free childcare, food assistance, and recreation and arts scholarships. Lauri additionally serves her community by advocating for graduate student parents on two university boards. Lauri Lutes is a PhD student at Oregon State University. She studies viruses on sweet cherry trees. She has an 8 year old daughter and she’s a single mom. 2:19 What is your current annual income and expenses? Lauri’s graduate stipend is $24,000 per year. Her assistantship is assured for her entire PhD, for either teaching or research. Her modest estimate of her current annual expenses is $27,000 to $30,000. These expenses cover a bare minimum, like paying rent, and don’t include expenses like a car payment. Her estimates don’t take into account her supplemental income from food assistance programs. According to MIT’s Living Wage Calculator (livingwage.mit.edu), the living wage for one adult with one child in Benton County, Oregon is $51,000 before tax/$42,000 after tax. In order to live with her daughter on her Oregon State University PhD stipend, Lauri has to take advantage of every possible resource. 4:24 What benefits do you receive and how did you find these benefits? When Lauri was considering graduate school, her daughter was four years old. Lauri was most interested in Pacific Northwest universities, and she was surprised to learn that Oregon State University offers resources to help graduate students who are parents be successful. Lauri receives two main benefits from the university. First, she receives a childcare subsidy that is provided through student fees and donor funding. Through the childcare subsidy, up to 50% of childcare expenses are covered. This subsidy is applicable for childcare for very young children before they’re in school, as well as for before and after school programs for children in public school. Lauri says it’s rare for a university to offer this assistance, and for the subsidy to cover up to 50%. Second, Lauri receives assistance for non-school childcare. Oregon State University has two childcare facilities that are drop-in for up to three hours per day. This service is free. The childcare facilities are located in the library and in the recreation center. They are open from 10am to 7pm on the weekends and during the weekdays as well. They accept children on a first-come, first-serve basis, but Lauri has not had problems with accessing childcare from these facilities. Student workers from child development, education relevant fields are the childcare providers. Lauri says the facilities are a well-managed, reliable resource for student parents. 9:31 What is your daily routine like? Is your advisor supportive? During Lauri’s first couple of years in her PhD program, she served in orchards throughout the entire State. Lauri had to take day trips and overnight trips for her work. She relied on friends and her community for help. Lately, she is in the lab for most of the day. She tries to keep a 9 to 5 work schedule. Her work doesn’t require her to be in the lab on the weekends. When she does travel, the bulk of her work is in the Columbia River Gorge, which is three hour drive from her university. Laurie says she has an incredibly supportive advisor. She says she is fortunate that her advisor doesn’t make her compromise her parenting for her work. During her graduate school interviews, Lauri didn’t emphasize that she had a daughter, but she didn’t make it a secret. She encourages other people to consider how their potential advisors would support them. 13:06 Tell us about your service experience on advisory boards and committees. Lauri was invited to join the advisory board of the university’s Family Resource Center. She viewed this as a place to get her voice heard, and to give a voice to graduate student parents. The advisory board decides on the budget for student fees, where that funding goes under the umbrella of the Family Resource Center. This budget includes the childcare assistance stipend, which is available for students with families on campus and employees with dependents. Additionally, Lauri is the graduate student representative on the committee for children, youth and families in the university’s faculty senate. This committee reports directly to president of the university. To Lauri, this seems like they can make changes on the university level. This committee considers the university experience of students and faculty with dependents, not limited to only young children. Lauri says they want to cultivate a culture of care at the university, that includes being able to support students and faculty in whatever is going on in their lives. When employers are sensitive to family and personal issues, people are kept in the workforce. 17:34 What strategies do you use to keep expenses down? Lauri emphasizes how important it was to let go of the stigma of needing help and asking for help. Before graduate school, Lauri had a stable position in industry and an income to support herself and her daughter. Graduate school brought a drastic change in income which was difficult to accept and deal with. To achieve her goal of getting a PhD, she had to use university and community resources. Lauri uses the food bank on campus, and has let go of the stigma of actually going to food bank. Food insecurity is not only experienced by people with families. It is an all too common issue being discussed at many universities. Over half of Lauri’s income goes to rent, and there is no way for her to make that better. Lauri says one way to supplement her income is in food assistance. She says she has to accept that this is where she’s at right now. Oregon State University manages a twitter account @eatfreeOSU that provides centralized posts of where there is leftover free food from events. Some people rely on free food from seminars. Lauri gets some funding through the SNAP food assistance program. She applied online, which she says was a fairly easy process, and had a phone interview. She had to prove her income initially and again every six months or whenever her income changes. SNAP benefits are for her daughter, not for use by her. The State of Oregon provides information for SNAP online. Oregon State University’s Human Services Resource Center is very helpful for students. Not every university has a centralized center for finding food assistance. Lauri is enrolled in Mealbux, a university program funded by student fees. She applies every term. The application is a questionnaire about a student’s income and food insecurity situation. The funds are loaded onto the student id card for use on campus. This assistance is specifically for Lauri. Mealbux helps with a student’s sense of belonging on campus. Lauri recently moved her daughter to school closer to home. At this new school, her daughter participates in free lunch program. Lauri has a car that is very old so she doesn’t have car payment. She rarely uses her car and expects it to break down anytime. She uses her bicycle to get around. She knows food expenses are hard to minimize. Lauri finds community resources in many places. Local parks and recreation department has scholarships available, such as one that allowed them membership to community pool. Her daughter gets scholarships to take classes, like dance class or painting class. These are things Lauri wouldn’t be able to afford otherwise. Another resource is the Arts for All programs that provide inexpensive tickets to theater events. Lauri says don’t be afraid to apply for help and scholarships. She wants to give her daughter opportunities that she can’t afford on her own. She’s always looking for resources and she’s not afraid to take advantage of available programs. 30:30 Why have you chosen to this frugal strategy instead of taking out student loans? Lauri has debt from her undergraduate education. These loans are deferred, but they are looming over her. She does not want to contribute more than she absolutely has to. She did take out a few loans to help transition into the PhD program. She has $30,000 loans for undergrad, and she’d rather make sacrifices now than contribute more to debt. Lauri used to make living wage and be comfortable. Her goal isn’t to increase her wages with her PhD. Her field, plant pathology, is not known for high wages. She wants to be open to a postdoc position after graduate school. She expects to make similar wages as she did in the industry job she had with a Bachelors degree. She went to graduate school for education, fulfillment, and opportunity. 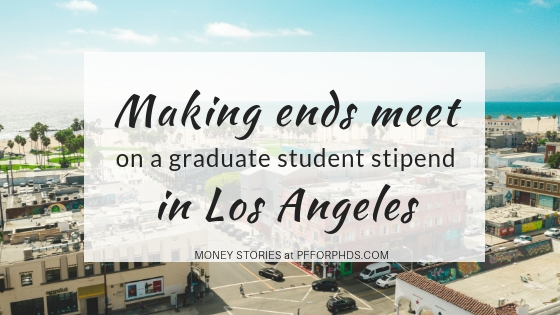 When she finishes her PhD, she won’t make a lot of money that she can use to pay off debt. Emily adds that it’s challenging to pay off debt at any time. Lauri advises graduate student parents to take advantage of resources. Search for them, ask about them, and talk to others about possible benefits. By diving into resources, you’ll become aware of more. 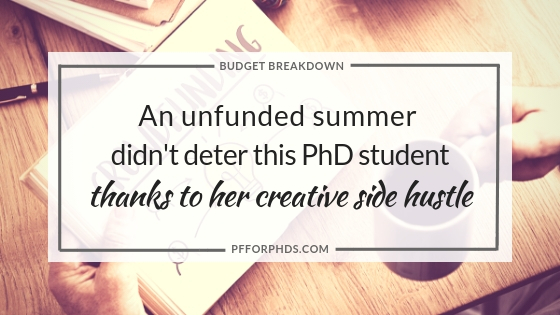 She believes that getting a PhD is worth the financial sacrifice. Though it is a financial challenge, don’t give up on your dreams. 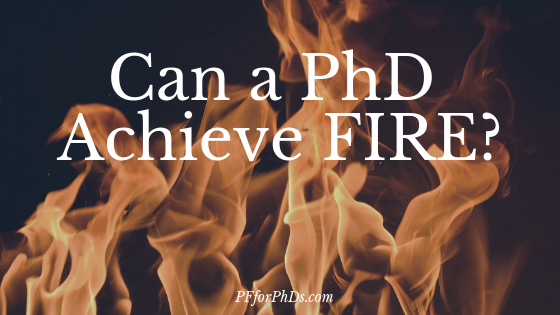 Can a PhD Achieve FIRE? Would you like for paid work to become optional for the rest of your life? What would you do with your time if you didn’t have to work? When you become “financially independent,” you have enough money and passive income streams to sustain you for the rest of your life without earning any more. At that point, you have the option of retiring (whether or not you actually do). Achieving this goal in youth or middle age instead of 65 is the objective of adherents of the FIRE movement (Financial Independence / Retire Early). Typically, FIRE walkers earn high salaries and save a radically large percentage of their income. This article explores whether FIRE is a good or reasonable goal for a PhD (graduate student, postdoc, or PhD with a Real Job) to set. The FIRE movement (or at least the current iteration of the trend) started to gain traction within the last decade. Two of the fathers of the movement who documented their FIRE journeys on popular blogs are Jacob Lund Fisker (Early Retirement Extreme) and Pete Adeney (Mr. Money Mustache). They both advocate establishing a very frugal lifestyle to 1) save a high percentage of your income while working and 2) minimize the size of the nest egg needed to retire from paid work. Now that the FIRE movement has gained popularity, it has diversified (it’s not just for young, single, male tech workers!) and splintered. One of the useful delineations is among ‘lean FIRE,’ ‘FIRE,’ and ‘fat FIRE.’ Roughly speaking, lean FIRE adherents seek to achieve FIRE primarily through expense minimization (and a high salary as well) while fat FIRE adherents seek to achieve FIRE primarily through vastly out-earning their spending (and keeping a lid on expenses as well), with regular FIRE falling somewhere in the middle. Why Would a PhD Want to FIRE? A person who completes a PhD has passion for her work (as well as incredible perseverance). I find it hard to imagine that such a person would want to retire early from her chosen field – especially those pursuing a life of the mind in academia. But people who complete PhDs are also people. They end up in all types of jobs with all levels of job satisfaction. Even those with high job satisfaction might want to escape the demands of full-time work. Even if retiring early is not attractive, becoming financially independent may be. Once you are financially independent, even if you keep working, you don’t have to be concerned about losing your job or put up with a job that’s no longer a good fit. Even during the journey to FIRE, you will have a much, much greater degree of financial security than most Americans, which brings peace of mind. While difficult and rare to achieve, the mechanism of becoming FIRE is easy to understand. To become financially independent (from active work), you need to have investments and/or passive income streams that will pay for your expenses in perpetuity. I’ll focus this discussion on the investments needed rather than the passive income streams. Basically, to achieve FIRE, you need a nest egg of investments that is large enough that you can withdraw what you need to live on each year without eating into the principal. The higher your living expenses, the larger the nest egg you need to support them in perpetuity. The 4% Rule shows you the two vital factors to FIRE: size of your nest egg and yearly living expenses. Therefore, to achieve FIRE you must save (invest) a lot of money and keep your living expenses in check. For example, for a household with $50,000 in yearly living expenses, a portfolio of $1,250,000 is needed. A person pursuing LeanFIRE will primarily focus on minimizing living expenses. The rough definition of LeanFIRE is living expenses of under $40,000/year or a portfolio of $1,000,000. A person pursuing FatFIRE will primarily focus on building a large portfolio. The rough definition of FatFIRE is a portfolio of over $2,500,000 or living expenses of at least $100,000/year. There is a delightful synergy between the necessarily high savings rate and necessarily low expenses. Given a static income, the less you spend on living expenses, the higher your savings rate can become, enabling you to achieve FIRE even faster. Mr. Money Mustache published in “The Shockingly Simple Math Behind Early Retirement” a set of ratios that illustrates the relationship between savings rate and years of saving needed until the SWR could be achieved. For example, with a savings rate of 10%, you need 51 years to save before you can retire, but that drops to 22 years with a savings rate of 40% and 8.5 years with a savings rate of 70%. Because the key to achieving FIRE is an unusually (to say the least) high savings rate, it is almost exclusively pursued by high income earners. There is a floor on how low you can drop your living expenses (although that varies person to person), so if your income doesn’t exceed your expenses by much, achieving the “E” in FIRE becomes a remote possibility. The ideal path for someone pursuing FIRE is to obtain a high-paying job immediately upon completion of their education at 18 or 22, commit to a low-cost lifestyle, set up a radically high savings rate into investments, and keep the pedal to the metal until FIRE is achieved, for instance by age 30 or 35. A PhD becomes derailed from this ideal path upon entering graduate school. Unless he previously set up massive passive income streams, a grad student’s income is nowhere near large enough to achieve a high savings rate (even if you live in a van like Ken Ilgunas did at Duke). This means that pursuing FIRE with a high savings rate will have to wait until landing a post-PhD Real Job. However, the graduate school experience offers a unique advantage to FIRE: A necessarily low lifestyle. The $40,000/year maximum living expense for the definition of LeanFIRE is much higher than what virtually every graduate student takes home after paying income tax. Even a couple living the graduate student lifestyle can usually spend less than that amount. A PhD also confers the possibility of a high income. While PhDs are not needed in currently high-paying careers such as finance, medicine (some specialties), computer science, and engineering, a person with a PhD does on average earn much more in a lifetime than the average person with less education, and people with PhDs can absolutely land well-paying jobs. Therefore, a PhD maintaining her grad school lifestyle (more or less) while earning a high salary post-PhD is a recipe for FIRE, albeit starting in earnest closer to age 30 than age 20. A LeanFIRE early retirement can still be achieved within a short period, and of course she could opt for FatFIRE if her income is generous enough. Instead of living at 100% of net income during graduate school, save (invest) as much as possible. This will have the dual effect of further lowering living expenses and getting a head start on building your nest egg. Experiment with frugality to discover whether you want to ultimately pursue LeanFIRE, FIRE, or FatFIRE. 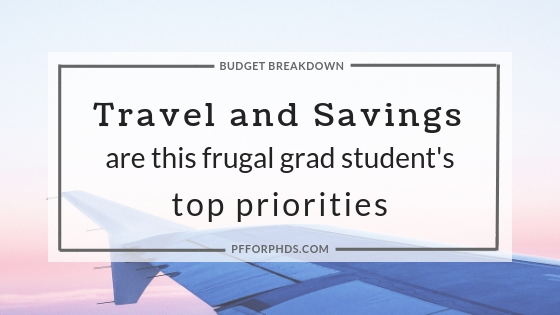 You may decide that living below a graduate student’s means is not what you want long-term. Finish your training as quickly as possible to increase your income as early as possible. Prepare yourself to land a high-paying job through professional development and networking. What Is Your Reason to FIRE? Ultimately, it’s vital to have clarity on why you want to pursue FIRE. It’s easy to become consumed by the numbers and the process and lose track of your motivation along the way. Sometimes it’s possible to achieve aspects of the FIRE lifestyle without actually being FIRE, and I think that’s particularly true for PhDs who have a lot of transferrable skills and potential for autonomy. Remember the parable of the fisherman and the businessman. Just like you shouldn’t put your “Real Life” on hold during graduate school, you shouldn’t put your Real Life on hold while building up to FIRE. If you are a PhD (-in-training) and seriously pursuing FIRE, I’d love to interview you on my podcast! Please fill out this form to volunteer. 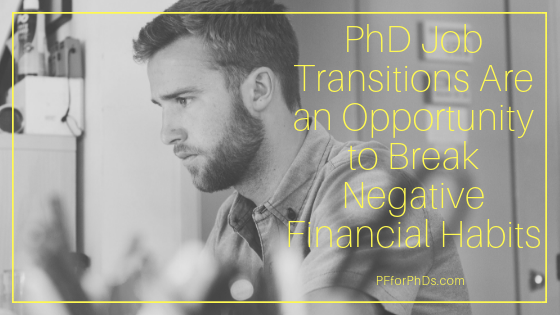 Pursuing a PhD and post-PhD jobs usually means frequent professional and personal upheaval. Changing jobs/”jobs” and moving are typical for each stage of training and possibly career: posbacc programs or jobs, master’s/PhD programs, postdocs, and Real Jobs. Every time you change jobs or move, your routines and habits are upended, including those that affect your finances. The upside of these frequent transitions is that each time you give yourself a clean slate upon which to write new habits. That’s great news for anyone with a degree of dissatisfaction with their current habits. I recently read Better Than Before by Gretchen Rubin, which is about how to create and maintain habits. The quotes included in this article are from the chapter “Temporary Becomes Permanent: Clean Slate.” While it is not a financial book, the strategies included in Better Than Before can be applied to your financial life, and the Strategy of the Clean Slate struck me as particularly useful for PhDs. A great proportion of our decisions each day are not ones we make consciously but rather are part of our routine or standard responses to stimuli. This is great when you have cultivated positive habits or at least are not in any negative habits. But a negative habit can be incredibly challenging to break under normal circumstances. Any beginning is a time of special power for habit creation, and at certain times we experience a clean slate, in which circumstances change in a way that makes a fresh start possible–if we’re alert for the opportunity. There’s a magic in the beginning of anything. We want to begin right, and a good start feels auspicious… Because we’re creatures of habit, the first marks on that slate often prove indelible. We should start the way we want to continue. When you experience a clean slate for whatever reason, you should very intentionally start practices that you want to become positive habits and keep yourself from falling back into old habits. This will likely take some preparation in advance of the occurrence of the clean slate. You should devote some time to brainstorming the positive habits you want to begin practicing and the negative habits you want to drop so that you’re ready to hit the ground running when you have that clean slate. I now pay very close attention to the first few times I do anything because I know those decisions will shape my baseline habits; to deviate from them will feel like a deprivation or an imposition. The slate may be wiped clean by a change in surroundings: a new apartment, a new city, even rearranged furniture. Or some major aspect of life may change: a new job, a new school, a new doctor. Job changes for PhDs come relatively frequently throughout training and sometimes following, and many or all of those job changes may very well involve a move. A new job in a new city is just about the cleanest slate you can get when it comes to your habits (not including changes in the members of your family): new home, new job, new co-workers, new commute, new city to learn. Not only are you in a different environment with your old triggers and routines wiped away, but the people surrounding you are no longer reinforcing your prior habits and associating you with them. You have a chance to forge relationships without succumbing to any negative habits. The entire point of a habit is that it takes little to no conscious decision-making to carry out. If you are aware of any mindless spending that you currently engage in, resolve to drop it with your upcoming clean slate (if not before!). Mindless spending is spending that you neither need nor even truly want to do. Perhaps it gives you some satisfaction, but it’s all too fleeting. You pick up a coffee every day during your commute because that’s what you always have in your hand on your way in. You browse a certain store and make a purchase on the same day of the week because that’s how you kill time in between work an an evening activity. You go out with the same people to the same bar/restaurant/club every weekend because that’s where you went when you first met them. Somehow these actions became habits even as your desire to do them faded. You may not have even realized the cumulative effect they were having on your finances. With your clean slate, you have the opportunity to drop these old habits and begin how you want to continue, e.g., brewing coffee at home, taking a route that doesn’t pass any shops, and meeting people through fun and less expensive activities. In many graduate programs and at many places, limiting your spending to the means provided by your stipend/salary is not possible or at least not palatable. In those cases, accruing debt, usually student loan or credit card debt, is a necessary evil. Still more PhDs (in training) accrue debt because of a lack of sufficient motivation to avoid it. Living beyond your means is a negative financial habit, necessary or not. When you start a new, higher-paying job, make a clean break with that habit. In your new job, you are A Person Who Lives Within Your Means. In fact, you should not only resolve to not accrue any new credit card (or similar) debt, but you should start repaying your accumulated debt. If credit cards were your debt of choice, stop putting new charges on them entirely. Sometimes a negative financial habit is simply the absence of a good financial habit. 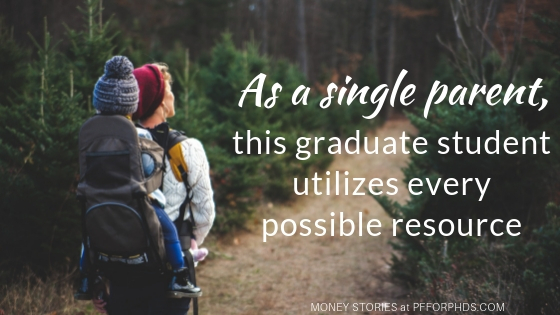 Your financial state during grad school or after can be so discouraging that you stop looking at it entirely. You might slip into being unaware of the balances in your checking and savings accounts, the balances on your credit cards, the total of your student loan debt, the value of your investments (if any! ), etc. At some point and after some healing, you’ll start looking at your finances again – perhaps when you have a higher income and the future looks rosier. With your clean slate, leave behind your habit of hiding your head in the sand and put in place a new habit of regularly looking over your finances comprehensively, even if it’s painful at first. Keeping up with the Joneses is a negative financial habit for anyone, but it’s particularly impossible for PhDs on trainee income. You don’t want to be in that habit when your higher income rolls in, as you might actually be able to make a go of keeping up. Do whatever you need to do to (leave/filter social media, stop watching HGTV) to keep the Joneses out of sight and out of mind. The Strategy of the Clean Slate can help us launch a new habit with less effort. With your clean slate, adopt a new identity as a person who practices positive financial habits and is actively working to improve your financial health. Tracking your spending and creating a spending plan (a budget) are fundamental tools for managing your finances well. Tracking can be done relatively automatically with software, so the easiest way to implement this habit is to sign up for Mint/You Need a Budget/similar, hook up your bank accounts, and check on your spending periodically (at least once per week). After you have an idea of your expenses, you can start projecting them with a budget, which will help you be mindful about your spending in your trouble areas. You may have to update your budget frequently if you’ve recently moved, but after some time checking in with it once a month or more will become automatic. That a candidate will attempt to negotiate a job offer is almost always expected. (Grad school offer letters are an exception, though some students do attempt to negotiate. Negotiating a postdoc offer is more common than you might think.) If your clean slate comes with a new job, be sure that you negotiate that job offer (and every one that follows). You may make an exception if the offer is clearly and objectively on the generous side of appropriate, but even then you can still try to negotiate some benefit. A raise gained through negotiation is the easiest money you’ll ever earn, and it compounds throughout your career! Post-clean slate and with a higher income, you are a saver, no matter what you were before. Enforce this positive financial habit by setting up automated transfers to your savings account, loans, or investments, depending on your goal. Incrementally increase your savings rate over time. Investing can be very intimidating to someone just starting to get their finances in order. It’s doubly intimidating for someone who doesn’t have access to a 401(k)/403(b)/similar like a grad student and some postdocs. With your clean slate, put in place the positive financial habit of investing (if that’s an appropriate financial goal). If your new job offers a retirement account match, by all means take full advantage, and invest beyond that up to your goal amount. Never leave match money on the table! It’s a shame not to exploit the power of the strategy of the Clean Slate when it presents itself. For instance, the time of moving introduces so much upheaval into our customary habits that change becomes far easier. In one study of people trying to make a change–such as changes in career or education, relationships, addictive behaviors, or health behaviors including dieting–36 percent of successful changes were associated with a move to a new place. While the clean slate offers tremendous opportunity for forming new habits, it can disrupt a person’s existing good habits by eliminating a useful cue or breaking up a positive routine. To this point in the article I have largely assumed that you have some negative financial habits that can be eliminated by a Clean Slate, and I’ve suggested positive financial habits to fill the vacuum. But you also may well have positive financial habits that will be jeopardized by the Clean Slate. It’s understandable that you habits will be disrupted by a Clean Slate as dramatic as a move and job change, so as soon as possible (before you feel settled and ready) jump right back into your old positive habits so you don’t slide into negative habits in their absence. As much as possible, maintain monitoring your habits through your transition so you have an accountability system urging you to return to them as soon as possible. This podcast episode is a budget breakdown with Latisha Franklin, a third-year graduate student in biochemistry and molecular biology at Penn State University. Latisha works to keep her housing and especially food spending low so that she can spend more on experiences, such as her yearly international vacation. She employs several powerful strategies in her frugality and budgeting to enable her saving, such as taking out cash for variable spending, prioritizing a “me” budget category, vegan meal prepping, and actually reading her email to find free food on campus. Emily and Latisha discuss how establishing a routine schedule lends itself well to developing frugal practices. Latisha Franklin is a third-year graduate student in the Biochemistry and Molecular Biology program at Penn State University. She moved to State College, Pennsylvania, for graduate school from her hometown Mobile, Alabama. Her stipend is $1,996 per month after taxes. 2:27 Q2: What are your five largest expenses each month? Latisha’s top expense categories are rent, car insurance, food, bills, and “me,” in other words, money she can spend freely on herself. She shares that she budgets much of her income for her Roth IRA and savings. Latisha lived in a one-bedroom apartment with her dog at the time of the interview. However, she had plans to move. Her rent was $820 per month and the rent in her new place is $710 per month. Originally, she wanted to move to a new place with a roommate. When those plans fell through, her realtor helped her find the new apartment. Her new apartment is attached to a house. She has access to a backyard for her dog, which was appealing to her. Her new apartment is closer to Penn State, a 5 minute drive and 20 minute walk from campus. The neighborhood is family-oriented. This is in contrast to her former neighborhood that had a good mix of graduate students, young families, and late-career adults. Latisha thinks Penn State graduate students living alone pay about $900 or more for rent. She thinks that $700 is the low end of the range for rents. In her estimates, she is not taking into account possible lower rents in shared housing with roommates. Latisha has a 2016 Hyundai Tuscon. She bought the car new in winter 2015 and paid it off completely within two years. She used savings she had been building since middle school to buy the car new. Her monthly insurance payment is $159. Latisha spends $150 per month on food. She spends $20 each week for food that she’ll eat during the week, and $50 each month to buy items she’ll use throughout the month. Her strategy to keep food expenses low is to meal prep and cook in bulk. During her first year, she found herself cooking every other day. Cooking was too time-intensive, so she read articles about meal prepping. Now, she uses Sundays as her meal prep and cooking day. She makes enough to last the week and portions food into six or seven containers. Latisha didn’t have any dietary restrictions or considerations during her first year in graduate school. She has now removed meat and dairy from her diet. She uses many kinds of beans, rice, nuts, and fruit in her meals. She buys fruit from the farmers markets and from her share of community supported agriculture (CSA). Her meals include muffins, which she eats every week, salads, soups, and pastas. Additionally, Latisha eats free meals on campus as often as three times a week. She takes ten minutes each day to read her university emails to find events with free food that also match her interest. She rarely eats take-out or at restaurants, and this expense is from her “me” category. Latisha’s pays for electricity and wifi, because heat and water are included in her rent. Her parents pay for her cell phone bills. The electricity bill is $13 per month and wifi bill is $32 per month. To keep electricity costs down, Latisha makes the most of daylight for work. During the evening, she relaxes and minimizes her electricity use. In her new apartment, she will have to pay for all utilities separately. She’ll have more bills, so she has planned to increase this budget category. Latisha’s strategy is to keep her “me” budget in cash. Using cash is strategy to keep variable spending in check. She mentions that credit cards didn’t suit her. 25:17 Q3: What are you currently doing to further your financial goals? Latisha prioritizes savings. Since her teenage years, she kept savings for undetermined large purchases. For example, she bought her new car with her savings, even though she hadn’t intentionally planned the purchase. She started savings with a CD, about three years ago, without much knowledge of savings or investing. Her dad encouraged her to get a Roth IRA. Latisha read Emily’s emails and is now working on better managing her Roth IRA. Latisha has set a goal to take one big trip a year. Here she discusses saving for her trip to Iceland. She has budgeted about $100 per month and has $1,200 saved at the time of the interview. She likes to travel and wants to get out and see the world while she has minimal responsibilities. Iceland is the first big trip that she has initiated on her own. 33:24 Q4: What don’t you spend money on that might surprise people? Latisha spends very little on food. Many of her peers claim to not have the time to cook, so they get take out or eat out more often. She found the time on the weekends to prepare all her meals for the week, so she saves time during the week. Emily and Latisha agree that in reality, getting take out or going to eat can take just as much time as preparing your own meals. Prioritizing cooking your own meals is a great frugal strategy. 35:34 Q5: What are you happy with in your spending and what would you like to change? Latisha is happy that most of her money goes to experiences, not things. She wants to add money to food, because she believes trying new kinds of foods is a good experience. Joining the CSA is one way she is trying new foods. She is interested in new fruits, like dragonfruit. Additionally, she is happy has “cushion money” so she is prepared for anything. 36:48 Q6: What is your best advice for someone new to your city who is budget-conscious? Latisha recommends over estimating your budget so you have cushion money. This reduces stress and helps even out irregular expenses. One strategy that Latisha uses is to set up separate accounts for her money. For example, she moves her income out of her spending account into a reserve account. This restricts how much money is available for her to spend, but the money is still accessible if she really needs it. Latisha also recommends personalizing your budget. She has had financial training that emphasizes certain income percentages for budget categories, but this advice doesn’t suit her lifestyle. She realized this when she went through the process of purchasing a home but ultimately could not get approval. During the process to buy a home, she found that financial advisors insisted that 50-60% of income is budgeted to living expenses. Though she was frustrated she couldn’t buy a home, she is glad she went through the process and would recommend the experience to other graduate students. 44:46 Q7: Would you like to make any other comments on what it takes to get by where you live on what you earn? Latisha takes the bus for her commute. She does not use her car for every day commuting, just for irregular driving, like taking her dog to the groomer. Penn state has a graduate students bus ridership program that Latisha says is a $180 one time fee, then free riding for the entire year. Just a few rides each month would make the pass pay off. She says this is definitely worth it. Latisha says her budget is possible because she manages her time carefully and sticks to a routine. Her budget is a result of her focused lifestyle. Emily and Latisha agree that budgeting is easier and more accessible when you recognize the patterns you have in place in your life. Latisha and Emily hope listeners learned more about frugal strategies for living on a graduate stipend.